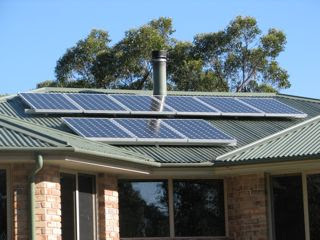 At the end of March we installed 1500W of solar panels and a 2kW grid-connected inverter. As of today it has supplied nearly 500kWh of energy. Yesterday we received our first Electricity bill that included a credit for the Solar generated electricity that we have sold to the grid. We have generated about 3.8kWh per day since the feed-in meter was installed. This is about 2/3 rds of our daily consumption. We also we notified that electricity and service charges have been increased 21.4% as of July. We are now paying about 20c per kWh including GST.